The short answer to the title’s question is “because the lowering of the sinus floor was not prevented earlier”. The more detailed answer follows below. 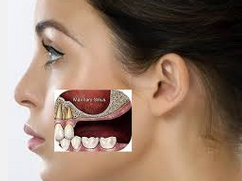 The Maxillary Sinus is located above the upper premolars and molars on each side. When the floor of the sinus collapses, the Sinus Lift procedure is needed in order to replace the missing teeth with dental implants. One very specific type of bone graft is the sinus lift. The maxilary sinus is located above the roots of the upper teeth from the first premolar to the last molar(if you count from the center midline, from the forth tooth all the way to the last tooth on each side). When teeth in those areas are extracted, the upper jaw undergoes a process known as pneumatization(the formation of more air cavities or increase in size of the existing one). One undesirable consequence of that is the floor of the sinus lowering. This decreases the height of bone necessary for placing dental implants. If dental implants are planned, the procedure called sinus lift is necessary before that in order to increase the height of the bone already lost through pneumatization. Picture showing the collapseof the alveolar bone and lowering of the sinus floor due to the extraction of an upper molar and not placing an implant soon enough. We come back to the same conclusion as mentioned above that it is better to prevent something to happen instead of treating it. If an upper tooth which had the tips of its roots below the maxillary sinus needs to be extracted, the best solution is to place the implants right away in order to prevent the lowering of the maxillary floor and the necessity of the sinus lift. As in the case of the alveolar bone, the immediate placement of the implants after the extraction of the upper teeth prevents the bone resorption including the lowering of the sinus floor. The sinus lift procedure is a very popular procedure amongst implant surgery providers. Regardless of the approach(lateral window or crestal), during the procedure, the sinus membrane is lifted from the floor of the sinus and the bone graft material is introduced into the new space created. The bone graft manufacturers claim that the bone graft material undergoes changes and becomes stable bone like the patient’s bone that is going to sustain the dental implant placed in there. Some practitioners claim that the bone graft resorbs a lot in time and the new bone that is formed in there does not have the quality of the existing “natural” bone of the patient. Diadram showing the bone loss corected with the sinus lift procedure and implant placement. Is the sinus lift material going to hold the dental implant as well as the patient’s own bone? Once again, why wait after the extraction to place the implants and need such a complex procedure with a questionable result, when you can place the implants right away and preserve your own bone ? Why have 2 surgeries instead of one? Why spend more money? Why take risks?